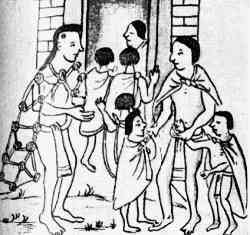 It's very interesting to wonder what life would have been like in a normal Aztec society family. There are many things we do know, although the record is frustratingly sparse. Record keepers were more interested in other aspects of society, and family life was considered the sphere of women. Still, there are many things we do know. Like other aspects of Aztec culture, life in an Aztec society family was permeated by religious beliefs, right from the start. Each decision was ruled by the laws of religion, and often tied to the sacred days in the Aztec calendar. The life of a new family began at marriage, typically in the early 20s for a man and mid-teens for the woman. Marriages were arranged by the relatives (though the children may have had input). The parents would have to talk to the religious leaders, and discuss the signs under which both of the children had been born. The wedding day, of course, was chosen for similar religious reasons. All this was full of ceremony and form. In Aztec society family a husband may have had more than one wife - but it would be his primary wife that would go through all the ceremony. The man may have many secondary wives, who would also be officially recognized. The children of the principal wife would be the inheritors - or, in the case of a ruler, only a child from the principal wife would be a successor. Still, the husband was supposed to treat all wives equally in daily life. As you may imagine, one family could grow very large. As a result, most of the husbands with numerous wives and children were the wealthy ones, with the poor more likely to have one wife. In one sense, society was dominated by the men. The man was considered the head of the home. However, women had a great deal of power as well. They may have had more power in earlier times, with men taking more power toward the end of the Aztec era. Women often were able to run business out of their homes, and had a lot of influence in the family and the raising of children. The older widows were much respected, and people listened to their advice. Adultery was a crime - death was the punishment. Divorce was allowed on certain grounds, presented by the man or woman, property was divided equally and both sides were free. Marriage marked the entrance into Aztec adult and independat society. The family was given a piece of land, and they would have their own home. Depending on their situation, both the man and the woman may be involved in working the land. Of course, while a woman was involved in household tasks, a man would be more likely to become a warrior. Though there were many occupations (farmer, priest, doctor, etc), being an Aztec warrior was particularly glorified. War was even used as a symbol of childbirth. The baby was a "captive" in the womb, struggling to be victorious. The woman, too, was in a battle. In fact, in many ways a woman who died in childbirth was glorified in the same way as a warrior who died in battle, and honoured for her courage. A soothsayer would be called to study the signs of the child. He would inquire about the exact moment of the child's birth. The birth would be cause for more ritual and great celebration. From what we know, parents loved their children very much. We know that parents often used flowery pet names for their children (for example, a father speaking to his son - "Nopiltze, nocuzque, noquetzale" - sweet son, my jewel, my precious feather. Then again, when it came to discipline, parents in an Aztec society family ruled with an iron hand. More on Aztec children here. I've written a little more about occupations and education here. Education, at least in the early years, was the responsibility of the parents. The father would teach the sons, and the mother the daughters. Work and education then would a big part of the Aztec society family. Work could also break up the family - the father might travel, or in the case of warriors may die on the battlefield. As I mentioned, discipline was often harsh. Up until the age of 8, the preferred method of discipline was simply verbal. But harsh punishments would be in store for the older child, as he was prepared for the harsher realities of Aztec life. As children grew older, parents would still be in charge of education, but they would more often send the children to school. There were various branches of education that children would be involved in. If a family member escaped death on the battlefield or death from illness and so on... they would be among the ueuetque - the wise elders of society. They would offer advice, either informally or on a council. Of course, they were held in high regard in the family itself. 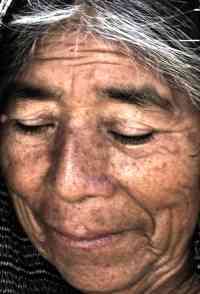 The elderly were important in the Aztec society family, and their health care, aging and death was also a matter of ritual and religion. An Aztec society family was ruled in many ways by religion, tradition, and structure. Life was ruled by fate - from beginning to end your family life, occupation, and success depended on the important dates in your life and the structure of the universe and the nature of the gods. At the same time, life was full of celebration, hard work, joy, sorrow, and love, much as it has been in societies around the world for all of history. For more on Aztec society family, I recommend Daily Life of the Aztecs by Jacques Soustelle.